The sixth annual UC Systemwide Bioengineering Symposium, held at UCSC in June, brought together a broad range of scientists and students to exchange ideas and share recent advances in the field of bioengineering. The three-day symposium, "Envisioning the Biomedical Future," included 172 participants from the biotechnology industry, the National Institutes of Health, and all of the UC campuses. Speakers throughout the symposium showed how advances in biomolecular engineering are shaping the biomedical future. 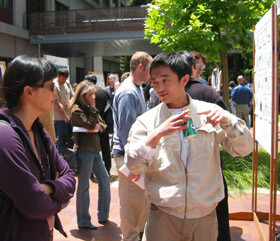 A number of UCSC researchers are among those at the forefront of these developments. "I am very pleased to see that UCSC's pioneering bioinformatics and bioengineering research programs are greatly enhancing our understanding at the biomolecular level," said Steve Kang, dean of UCSC's Baskin School of Engineering. The symposium chair, professor of electrical engineering Wentai Liu, directs the research activities at UCSC of the multi-institutional Center for Biomimetic MicroElectronic Systems. The retinal prosthesis he and his collaborators have invented to restore sight to the blind was among the research projects presented at the symposium. David Haussler, professor of biomolecular engineering at UCSC and a Howard Hughes Medical Institute investigator, described new understanding being gained at the edges of genome science through computer analysis of genome evolution. Haussler's research has also contributed to two other projects highlighted at the symposium--nanopore technology for DNA analysis and microarrays for detecting genetic variations. The ability to sequence an individual's genome for less than $1,000 is a major goal of genome scientists, and nanopore technology has the potential to make personal genome sequencing available for as little as $100, said Jim Hollenhorst, molecular technology lab director at Agilent Laboratories. Nanopore technology is being developed at UCSC by David Deamer, professor of chemistry and biochemistry and acting chair of biomolecular engineering, and Mark Akeson, associate adjunct professor of biomolecular engineering. Their device employs an electric field to pull individual DNA molecules through a tiny pore, resulting in distinctive signals that can be used to identify different DNA molecules. Stephen Fodor, president and CEO of Affymetrix Laboratories, described methods for decreasing the cost of detecting genetic variations between individuals through the use of microarrays (also called "gene chips"). One common type of genetic variation is known as a single nucleotide polymorphism (SNP), and a new 96-well plate containing microarray chips can test for all of the known SNPs in the human genome, Fodor said. "Through the use of microarrays, we can discover the genetic basis for variation in health among humans," he said. Many biomedical researchers are intent on understanding and targeting individual differences in susceptibility to disease and responses to drugs. Roderic Pettigrew, director of the National Institute for Biomedical Imaging and Bioengineering (NIBIB), described how research under way now will enable personalized medicine in the near future. He lauded nanotechnology advances that have improved cellular and molecular imaging and have paved the way for targeted drug delivery systems, which are already showing promise in cancer treatment. Pettigrew went on to describe advances in regenerative medicine, where manufactured tissues infused with cells, developmental nutrients, and growth stimulants can help regenerate nerves or restore tissues. He also credited advances in computing, bioinformatics, and imaging for opening the way to improved patient care in the future. For example, image-guided intervention can improve outcomes in microsurgery and make it easier to do targeted brain surgery. Wireless technology under development at the Alfred Mann Foundation may lead to a new generation of implantable devices for restoring movement to paralyzed muscles, according to the foundation's president and chief scientist Joseph Schulman. Wireless technology could reduce the risk of infection from implanted wires, which has hindered earlier approaches to electrical muscle stimulation, and would also reduce the expense and difficulty of the surgery to implant the stimulators, Schulman said. A number of speakers commented on the dramatic increase in the need for elder care expected in the decades to come. "Elder care is returning home," said Terry Dishongh, senior staff researcher and lead hardware engineer of the Intel Corporation Proactive Health Research Team. Dishong described a home monitoring system to make it possible for caregivers to monitor elders' well-being from a distance, even as the elders continue to live on their own. "Connecting all of the various digital devices people now use can help show whether people are well," he said. Home monitoring systems promise to reduce the cost of care while increasing the quality and connectedness of elders' lives, Dishongh said. They show particular promise for elders suffering from memory impairments, because the systems feature feedback and reminder systems. Symposium participants got a crash course in the business end of bioengineering technology from Rick Ellinger, managing director of the venture capital firm Innovation Growth Partners. Cures for disease, he said, are one of the "irresistible forces of demand." He went on to say that university-based scientists must adapt to the different way of thinking in business environments. Whereas "publish or perish" drives the grant-driven academic world, the counterpart in industry is "demo or die," Ellinger said. To gain venture funding, scientists must show the practical applications of their research. "A demonstrated science experiment is not a scalable production process," he said. Ellinger indicated that venture capitalists also need reeducation to appreciate the bioengineering world. They need to understand that nanotech and biotech do not require the high level of funding needed to bring products to market in the semiconductor industry. With biotech, he said, "you can accomplish a lot with less funding from a bottom-up approach." Dean Kang expressed enthusiasm for the merging of engineering and biomedical science. "Bioinformatics will be key to improving medicine, by making it more quantitative. If you want to build a plane or a car, you need excellent analysis. Bringing that same rigor to medicine will lead to improvements," Kang said. William Heetderks, associate director for extramural science programs at NIBIB, summed up the general tone of the symposium when he said, "This is the 21st century. We expect that we are going to be able to do something about disease." The symposium was organized by the UCSC branch of the Bioengineering Institute of California, UCSC's Center for Biomolecular Science and Engineering, and the UCSC branch of the California Institute for Quantitative Biomedical Research (QB3).